Maximuscle Progain Extreme - Cyclone on Gear! Progain Extreme from Maximuscle seems to be an alternative to Cyclone but more suitable for anyone looking to use the product as a primary source of protein and a way of increasing calories significantly. Less Creatine per g of product which enables bigger serving sizes and a higher protein and calorie intake. Priced the same as Cyclone I (Pete) think Maximuscle Progain Extreme may well take over from Cyclone as the preferred weight gainer. Obviously the bigger serving size makes for just 16 servings per tub but at 500 Kcal, 40g protein, 50g carbs, 3g creatine, HMB etc it is certainly a well rounded product. If I had �2 to spend on some form of food, I'd choose Progain Extreme every time in preference to a ready made sandwich containing the same calories with a third of the protein. However I can't comment on taste just yet as we haven't popped open a tub, I would expect the taste to be very close to regular progain though. Our most successful and popular weight-gainer now turbo-charged and made more powerful and effective than ever. Progain Extreme is the next generation of weight gainers and has been designed to deliver the most rapid gains in muscle mass and strength possible with a weight gainer. It contains ingredients and a formula based on the latest research into muscle growth and weight gain. Progain Extreme contains a massive 3g of free form and bound Leucine, which could be the most important amino acid when it comes to triggering new muscle growth. You'll also find 3g of MaxPure� Creatine in every serving. If that wasn't enough, it contains 3g of total Glutamine peptides, which is well absorbed by the body. 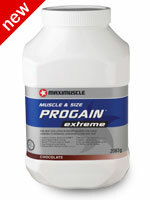 Mix 2 scoops (125g) of Progain Extreme� (PE) with 500ml of water. Stir with a fork for around 10 seconds or mix in a Maximuscle shaker and drink within 5 minutes. PE is best when mixed with water, not milk or fruit juice. 2083g (16 servings) per tub. Goods sent on a next day delivery by our Carrier service.